So I got to thinking: Like Thanksgiving morning, Christmas morning is a somewhat important time meal wise for the family and other gatherings. Some people have friends and family over Christmas morning before opening presents, or some opt for a Christmas brunch… so why not come up with something decadent? Not only decadent but can also be prepped ahead of time, cooked in a large casserole dish for large gatherings, and something you don’t have to stand over a stove and “babysit” while Christmas is happening all around you. I also remembered that I had frozen wild blueberries from my friend Jim Roth, that he harvested from his father’s farm, that needed to be used… and voila! 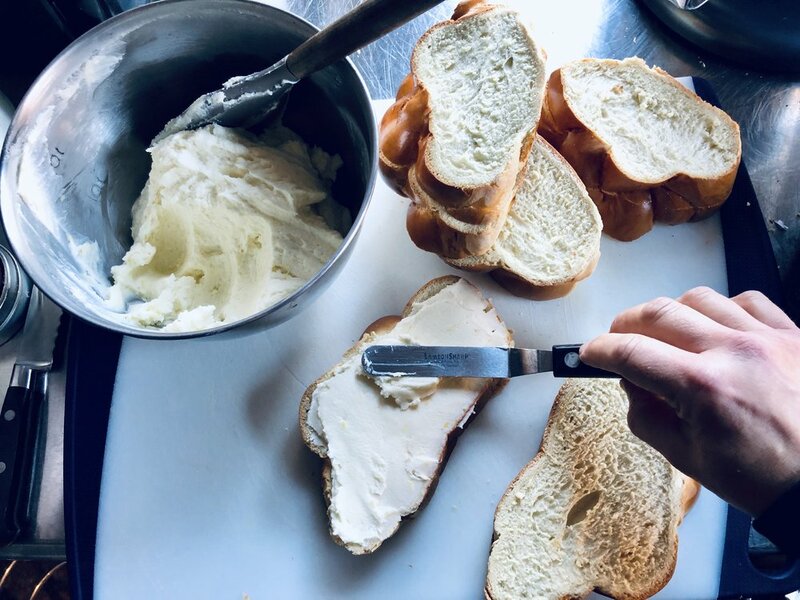 A new (Stuffed) French Toast recipe was born! If you are having brunch or a large breakfast buffet with a lot of other items, and want smaller portions, try using a classic French baguette or three. Slice them at least 2” thick, make a horizontal cut on top of each slice and spoon/pipe in the filling. This will create smaller, easy to manage option on each your guest’s plate. Butter the inside of a large casserole or deep ovenproof dish. Preheat your oven to 350 degrees. Slice the challah or whatever you choose to use at least 1” thick. We will be “sandwiching” these slices with the filling. Set aside to “air dry” a bit. In a mixing bowl add your softened cream cheese along with the mascarpone cheese. 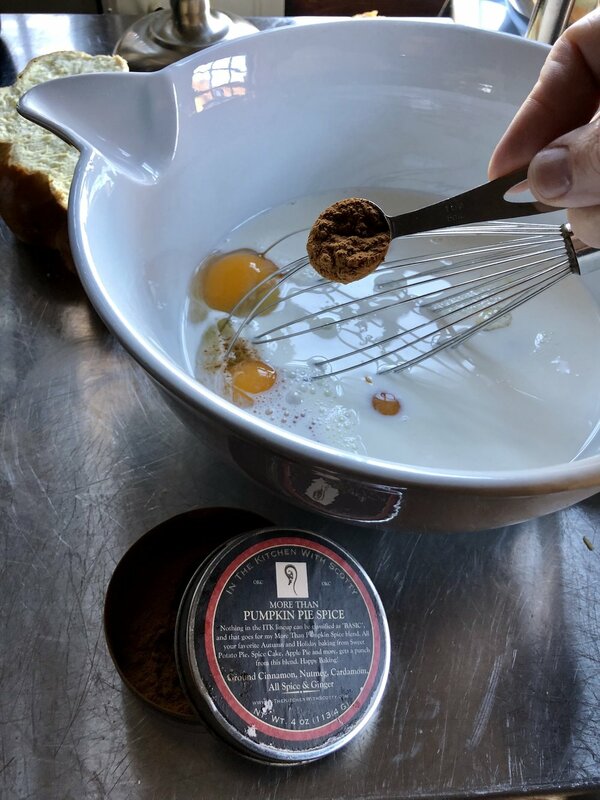 Mix with a hand mixer or spoon to combine. Add the granulated sugar along with two tablespoons of fresh lemon zest. Mix until nice and smooth. Set aside. In a separate mixing bowl combine the eggs, half-n-half, More Than Pumpkin Pie Spice or Cinnamon, and the zest of the last remaining lemon. Mix the custard (this is what you are making… a custard) with a whisk until thoroughly blended. Take each slice of bread and spread a nice thick layer of the lemon/cheese filling on each corresponding slice. Remember these will be “sandwiched” so slices need to match up. Place the two slices together to make one whole stuffed french toast, and you will want around 1/2” thick layer of lemon cheese filling between each sandwich. Depending on your bread you may have really long/wide pieces. Just cut those in half after you have sandwiched them. Once all of your slices have been layered, sandwiched, and cut if necessary, place them into your buttered casserole dish. Pour the custard over and in between the gaps of the French toast; Do so evenly. Gently lift up each slice after adding the custard to ensure the custard has coated the bottoms of the French toast. Place the casserole into your oven and bake for 42-45 minutes, or until the tops are golden and the center of the casserole is just set. While the French toast is baking start on the blueberry sauce: In a large saucepan add the light brown sugar and cornstarch then mix until combined. Pour in the lemon juice and melted butter, and mix with a spoon to make sure there are no lumps. Add the frozen blueberries to the pot, stir, and begin to heat slowly on medium-high heat. Gently stir the mixture while it is heating as to not scorch the bottom. Heat and stir until the blueberry sauce thickens, burps, and becomes a smooth blueberry sauce. Remove the casserole from the oven and let it rest 15 minutes. 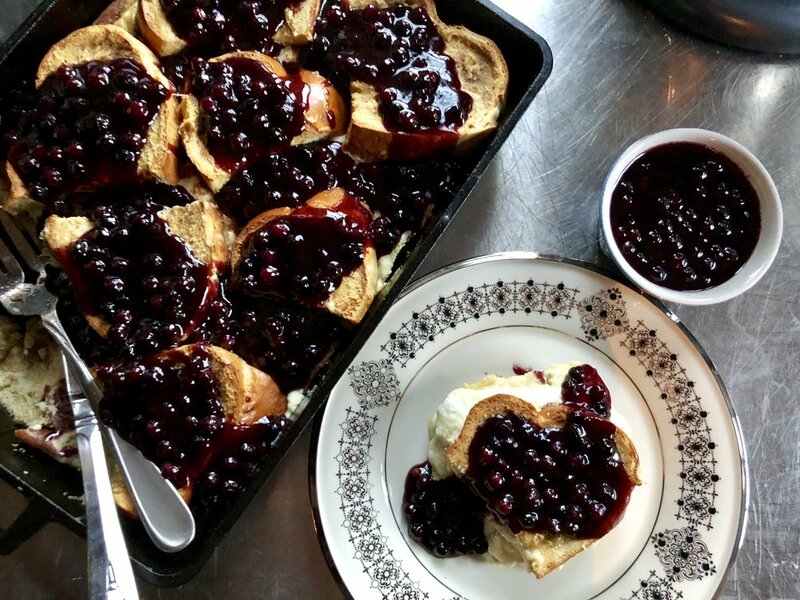 When ready to serve carefully spoon the blueberry sauce over each portion of the French toast casserole and serve right away! Enjoy!